Mamas, we know you need nail polish that lasts. What’s the point in even getting a manicure if it’s going to chip within a day or two? In a previous post I discussed gel manicures which are definitely an option, but they still require a trip to the salon, so save them for a special occasion or vacation. For all the busy days in between, we’ve found a way to do them yourself, have them dry in no time, and last for almost a week. Now, what I am about to tell you is based on my own experience. There is no fancy press release or over-enthusiastic salesperson feeding me information that may or may not be true. This trial was done over a period of a few weeks on my very own hands. 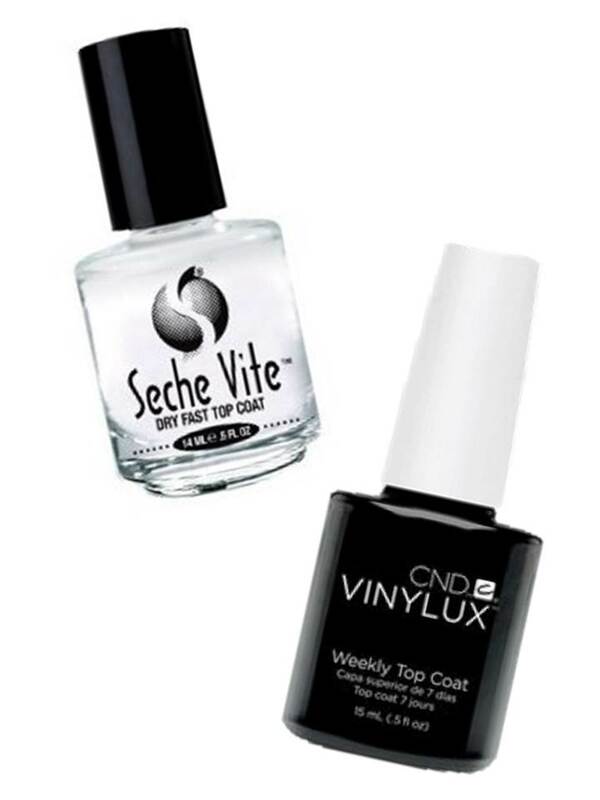 As I started my quest for a super shiny top coat two names kept coming up Seche Vite ($4.60/Amazon) and Vinylux ($6.55/Amazon). Additionally, both had rave reviews for being fast-drying and long-lasting as well. Score! I was happy to find that they were available from Amazon. I needed to order a few other things from the site and was relieved I wouldn’t have to run yet another errand to get them. First, I painted my nails with my current favorite color and didn’t use a base coat (because I didn’t have one, but I hear they make manicures last even longer – I’ll try that out another other time and report back). Then, I put a coat of Seche Vite on one hand and Vinylux on the other. My main problem (and probably yours too) with at-home manis is not getting the polish on, it’s keeping my hands still while waiting for it to dry. I was thrilled to find that within 10 minutes both top coats were dry to the touch. They weren’t gauge-proof but they were definitely dry enough for me to get on with my day. Both polishes were shiny (which is a big part of what makes a mani look its best) and while they dulled a bit after a couple of days, they still remained shinier than most, especially the Seche Vite. By day five both hands still had pretty intact manicures. Maybe there was a small piece missing here or there but it wasn’t very noticeable. In the end though, the clear winner in durability was Vinylux. By day seven both hands were ready for a re-do but the Seche Vite nails were much more chipped (although they were still shiny!). Overall, I like both of these products equally. I only wished the Vinylux had stayed shiny longer and the Seche Vite lasted longer. But then, I had the genius idea to combine them! So, the next time I painted my nails I put a coat of Seche Vite over the Vinylux. It worked! With no extra time or money for a manicure these days I am enjoying being able to have one that looks somewhat professional (due to the shininess) and, aside from a gel mani, lasts longer than any from a salon. (Note to self: Next time I get my nails done at a salon, take my Vinylux and Seche Vite for them to use.) No, it isn’t perfection but it’s definitely close enough.